Dev Devaki was born in Oxford, England, and immigrated to Canada in 1969. A free-spirited and ambitious young woman, she found employment as a secretary and worked her way across Canada. When she landed in the Comox Valley, she knew that she had found ‘home.’ Bored with working in an office and longing to be able to earn a living in the outdoors, Devaki became a tree planter and camp cook. After 14 years, she switched careers again and became a successful ‘alternative realtor’ who specialized in finding unique rural properties on Vancouver Island for her clients. She made lots of friends, earned a decent living, and eventually burned herself out by working too hard. Needing a break from the busyness that had become her life, she moved to the Interior of British Columbia in the year 2000. She began farm sitting and learned the art of sheep herding. This work suited her well as she reveled in the serenity that living in remote locations offered. But never in a million years did she think it would lead her to become a savior for donkeys! In 2005, Devaki purchased a farm on Mount Tappen, near Salmon Arm. The farm came complete with 50 sheep and three llamas. The then 65-year-old woman was looking for a non-lethal way to protect her flock from predators. 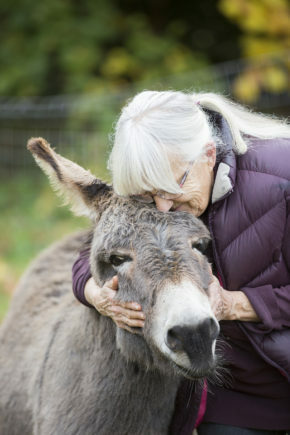 She learned that donkeys are intolerant—even aggressive—toward unwanted advances by dogs, coyotes, wolves, and other predators, and they have been utilized for decades as guard animals. A ‘Jack’ donkey, which is an intact male of any donkey breed, is usually the best choice for the role of a flock guardian. So, she went in search of “a donkey with all his manly bits,” she says. A friend told her about one that was being given away at a petting farm, so she went to take a look. “I checked out this placid little Sicilian donkey and thought that he would be perfect,” recalls Devaki with a smile. “Not knowing that there were two Jacks at the farm that day, I arranged for a friend to pick up the Jack donkey and deliver him to me. I couldn’t believe my eyes when this big red beast came charging out of the trailer and proceeded to honk, snort and race around the paddock! She kept the donkey, named Red, and Devaki says he was “a beautiful beast, but very noisy.” His constant braying indicated that he was lonely. She heard about someone who had a mule—a cross between a male donkey and a female horse—to rehome. “Inky the mule had been raised by a loving horseman and had been broke to ride and trained to pull a cart,” Devaki says. “They were very bonded. The year that the little mule turned 10, the man died of cancer. Inky clearly missed him and repeatedly ran away from the farm where the wife was now taking care of her. The neighbors were concerned for Inky’s safety, so Devaki said she would take her. At first, the black mule seemed nervous of women and wasn’t easy to handle, but Inky and Red were perfect for each other. They played, chased and teased each other, slept side-by-side and had a loving relationship. It turns out that Devaki was not alone. Sadly, many people acquire these long-eared equines without fully understanding basic donkey husbandry. They don’t recognize that handling and training a donkey is not the same as working with a horse. They don’t take into consideration that the animals can live 35 to 50 years. And they don’t seek help.The Turtle Valley Donkey Refuge (TVDR) has been providing information to donkey owners and a sanctuary for donkeys since 1999. They now provide a forever home to 104 donkeys with ongoing physical and/or mental health issues that make them unsuitable for adoption. “An increase in demand for donkeys in the mid-to-late 1990s resulted in a significant increase in the number of breeders in North America,” says Shirley Mainprize, TVDR’s president, co-founder, and executive director. “Initially, donkeys were purchased in multiples by novice owners and the breeders, for the most part, were particular about who they sold them to,” explains Mainprize. “They checked references and sold only to those whom they believed would provide good homes for the donkeys. The novelty of owning donkeys wore off, but the breeding continued. Many overstocked breeders began to sell to unsuitable owners who were ill-prepared to care for their purchases. 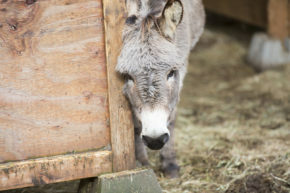 Mainprize says that the slippery slope from a well-kept donkey to one that is in crisis begins when the owner cannot or will not continue to be responsible for animal’s physical and mental health. 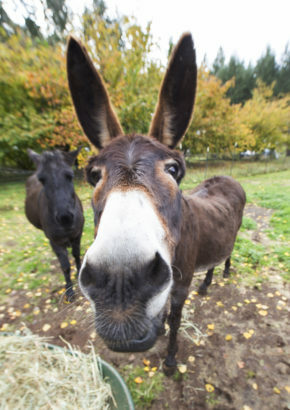 Irresponsible owners merely stop giving proper care, and the donkey suffers greatly until he is either rescued or dies. Armed with educational support from TVDR, Devaki continued to live on the farm on Tappen Mountain and cared for Red and Inky. Word soon got out that she had a soft spot in her heart and room on her farm for donkeys. She frequented the auction markets, bringing home healthy donkeys and re-homing them to carefully selected farms. Sadly, due to complications from old age, Devaki bid farewell to Red in 2012, about the same time that her satisfaction with living a reclusive life began to wane. The winter of 2014 was a tough one for Devaki and her animals. Challenged with aging and the harsh winters, she put her farm up for sale and began the process of rehoming her sheep, llamas, a horse and two mini-hinnies. (A hinny is a cross between a male horse and female donkey.) 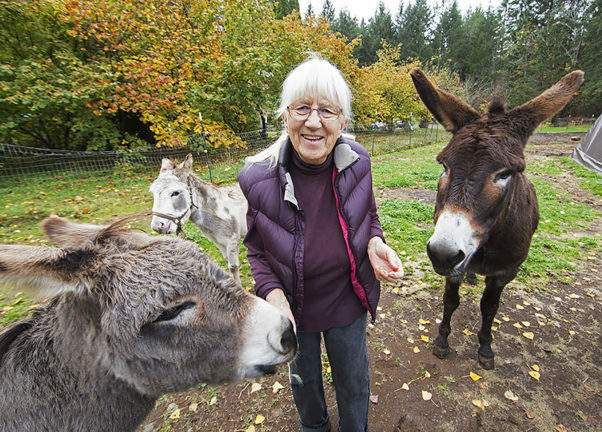 In November 2015, with the encouragement and help of her Vancouver Island friends, she rented a house on a small farm in Royston and moved back, with two dogs, four donkeys, and the now 25-year-old Inky the mule. Friends stepped up to help her erect safe fencing and build shelters for the animals. They continue to provide her with support by coming to the farm to walk and groom the donkeys (and one mule). Michael, Cara, Josephine, Steve and Alice come every Tuesday to hand walk them down lush forest trails. Neighborhood kids come to feed them. People of various abilities and ages find great calm and joy from stroking and grooming them. Like Devaki herself, each member of her fuzzy-faced menagerie has a unique story. Pedro, a 30-year-old Sicilian donkey, was in need of a home when the petting farm where grew up went bankrupt. He came with his geriatric mother, Maria. Unfortunately, Maria had a severe and painful inflammatory condition in the tissues of her hooves. After a couple of years, she was humanely euthanized. Jake, another Sicilian, was believed to be about 15 years old when he was discovered at an auction market. No one was bidding on him and, when that happens, the meat buyers take over. Devaki bought him and brought the gentle little Jack donkey home with her. Queenie is a beautiful Mammoth donkey cross who had belonged to a homeless woman who had been travelling around from farm to farm in the Interior of BC with a horse, a donkey and several dogs in tow. The woman was running out of options her herself and her animals, so Devaki offered her $300 for Queenie. By the time Devaki went to bring Queenie home, the donkey had bonded with a friend’s little American Piebald donkey named Dolly (who had also been rescued from an auction). Poor little Dolly went bonkers when Queenie was loaded into the trailer, so along came Dolly, too. Both are now in their mid-20s. Not much is known about either animal’s previous life, but they are now safe. And they are loved. 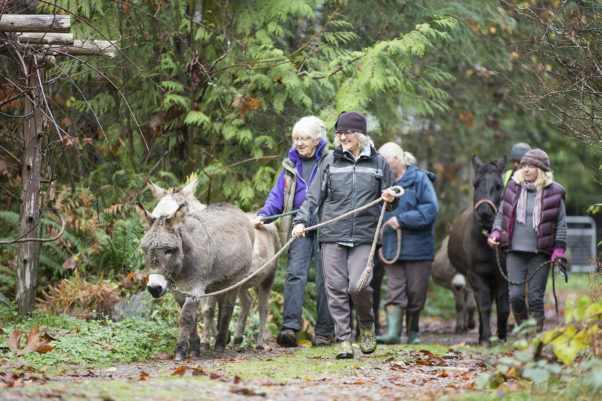 It has been 12 months since relocating to Vancouver Island, and Devaki and her donkeys feel right at home. She is thrilled to have connected with veterinarian Dr. Alberto Ruiz of AgaveVet Mobile Veterinary Care. Dr. Ruiz comes from Mexico and has had plenty of experience with donkeys, so they are in good hands from a medical care point-of-view. Some of Dr. Ruiz’s earliest and fondest experiences were riding (and falling off of) the water-fetching donkeys in rural Mexico. While the donkeys bring joy, it comes at a cost. Caring for them averages about $5,000 a year. Devaki is living on a pension and using up her savings to provide for them. She is asking the public’s support to help to pay for the cost of feed, farrier services, veterinary and dental care, to ensure that Inky, Jake, Queenie, Pedro and Dolly can live out their natural lives together. She has started a Go Fund Me page and would appreciate any contributions. The donkeys are also working to contribute to the cost of care in the only way they are able. Any avid gardeners or mushroom growers who need manure can either get the manure off the field for free or call to come and pick up bags and donate to the donkey care fund. Devaki also welcomes inquiries from anyone who may be interested in assisting with the day-to-day care or becoming a weekly walker, because the more people who work with these five animals, the happier they will be. And she guarantees they will make you smile.